Imagine having a “brain makeover” where you could have a team of experts change your lifestyle to create the perfect environment for your brain. What would your daily routine look like? 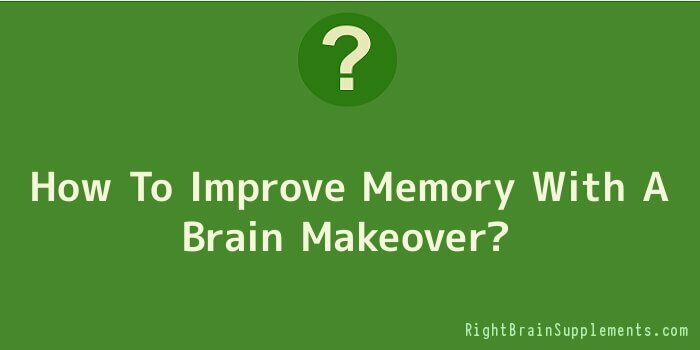 Follow me through your brain’s ideal day where it will get everything it needs to function at its best, and learn how to improve your memory along the way. Researchers have found that any new information you learned the previous day won’t be solidly recorded in your brain unless you have a good night’s sleep. Dreams are necessary to form new memories. Some doctors compare your brain to Jell-O and dreams help to solidify these new memories in your brain. Start the morning with the perfect breakfast. It’s true. You and your brain need to eat a good breakfast. Your brain is a very hungry organ – it uses 20% of your calorie intake. It needs energy and some glucose to get going in the morning. Don’t overwhelm it with coffee and sugar which will give you a quick jolt but have your blood sugar plummeting by mid-morning. Trade your morning coffee for a cup of green tea instead. It has a fraction of the caffeine and contains L-theanine. L-theanine is an amino acid that creates alpha brain waves and puts you in the same brain state as people who meditate. It also releases neurotransmitters that can improve memory recall, learning, and positive mood. Have a few eggs. Eggs contain blood sugar-levelling protein and are high in choline which can enhance brain function and memory. Round out your breakfast with a side dish of oatmeal. To increase brain power further, sprinkle with flax seed, berries, and walnuts. You just gave your brain five of the top brain foods in one meal! Spend 15 minutes engaging in the ancient practice of meditation. Meditation has been touted as having innumerable benefits. While researching the effects of meditation on memory, I encountered one site that lists 100 (!) health benefits, including memory loss prevention. If you can’t picture yourself sitting cross-legged on the floor, that’s OK! You can sit upright in a comfortable chair. Lying down isn’t recommended because it tends to make you fall asleep. Sleeping, as refreshing as it is, isn’t the same as meditating. The Alzheimer’s Research and Prevention Foundation (in my home town of Tucson) devised a simple meditation for seniors with varying levels of memory impairment. Quietly chanting the sounds “sa, ta, na, ma” for 12 minutes per day was found to improve memory. Since meditation is a great stress reliever, this is an additional way it can benefit your brain. Your brain doesn’t like to be stressed out any more than you do! Eat a healthy lunch instead of fast food. Lunch can be a challenge, especially if you have to eat out frequently. Even if you eat at fast food restaurants, there are usually a few healthy options such as getting a salad, yogurt, and fruit. Researchers at Mayo Clinic have found a correlation between eating a high calorie diet and memory loss, so skip the burger, fries, and soda as often as you can. Don’t forget to take your multivitamin. A good multi has been shown to improve long term memory. Exercise outside while the sun is shining. Exercise, especially done outdoors, not only keeps your body healthy, but can keep your mind sharp and healthy, too. An unfortunate aspect of growing older is that part of the brain, the hippocampus, actually starts to shrink. And with the shrinkage comes loss of cognitive function. Research has proven that moderate exercise can actually increase the size of the hippocampus, reversing this disturbing trend. Exercise encourages growth of new brain cells and oxygenates your brain. One study showed doing as little as walking one mile a day can significantly improve brain function. There is a correlation between low mood, poor memory, depression, problem solving, and low levels of vitamin D. Getting some sun exposure twice a week is the best way to boost Vitamin D levels naturally. Take a nap in the afternoon. After all that sunshine and exercise, you might be ready to take a nap! Napping is one of the easiest ways to improve memory. Studies have shown that taking even a 12 minute cat nap during the day can help people remember what they learned earlier that day. But napping long enough to have dreams, usually about 90 minutes, seems to be even better for improving memory. Interestingly, it’s believed that dreaming itself doesn’t improve memory, but is a by-product of memories being processed. Enjoy a healthy dinner full of nutrients to help your brain and memory. Luckily, food that is good for your brain is also pretty tasty. Start with a glass of red wine which has been found to be particularly good for memory, in moderation, of course. It is high in antioxidants that stop destructive proteins from accumulating in the brain and are believed to help prevent Alzheimer’s. Make your main course salmon. It is the best source of dietary omega-3 fatty acids. These are largely missing from our diets and can improve overall brain health and memory while helping with dementia and Alzheimer’s. The top vegetable side dishes that can improve your memory include beets and spinach. End dinner with some dark chocolate. Increasing brain power can be delicious! 7. Turn Off the TV No television tonight. Spend the evening actively using your brain. Watching TV is a passive mental activity and does nothing to help your brain. There are many things you can do in the evening that can help your brain and improve your memory. Play games that make you think, such as bridge, chess, or Scrabble. Take a class at your local community college to learn a new language or a new art form. Get on your computer and play some brain games. I know you will likely never have an ideal day like this. But I hope this will encourage you to add some of these lifestyle changes to your new daily routine so you can create your own super memory.